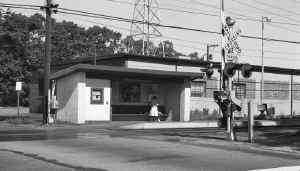 During the summer of 1972 when I was an extra ticket clerk, I once worked the East Rockaway station. It was a “newer” and smaller building on the east side of the tracks. It was only open for ticket sales for several morning hours on Mondays to sell commutation tickets. 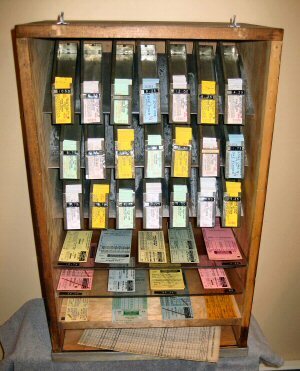 I had to drive to Lynbrook station and pick up a “portable ticket office” (A heavy, cumbersome, wooden box filled with ticket stock, dater and cast metal dater die, rubber stamps, etc. and a large padlock on the outside of the box, all weighing in at around 50 pounds) then take the train down to East Rockaway. Then, get off the train, and lug the box down the platform, over the crossing and back down the other platform to get to the station. I had less of a walk going back. Had to do the same thing for Merillon Avenue , only picked up my stock box at Mineola and had to drive to Merillon Ave. station. There were several other stations that had a temporary agency; Albertson was one; Hunterspoint Avenue was another one. Here’s the inside of the box with ticket stock. 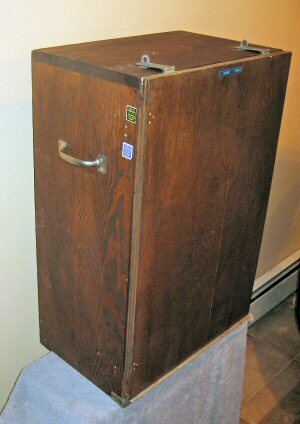 There would be a LOT of commutation ticket pads (weekly and monthly tickets) and the dater die and rubber stamps would be stuffed in whatever cubby hole had room. This case is believed to have been the extra ticket case that was used on Friday afternoons at Hunterspoint Avenue in L. I. City . (Both photos courtesy of David M. Morrison). Back to Merillon Ave.; unfortunately there were no toilet facilities at either Merillon Ave. or East Rockaway and it smelled accordingly. I walked across the parking lot to a 7-11, bought a large coffee and after drinking it, used the cup to recycle my morning coffee. I trained as a summer extra ticket clerk in the old baggage room at the west end of the Garden City depot. Basic training classes were held there for several days and after the class training was over, I was sent out for “on-the-job” training, called “posting.” I was “posted” to the Farmingdale station under the head ticket clerk there whose name was Barbara Stillwagon. There, under her supervision, I worked for about a week selling tickets, doing daily remittances and performing the other duties of a ticket clerk. After that week of “posting” was over, I was on my own. I had to “shape up” daily, which meant I had to call in every day to see where I was to work the next day. Clerks who didn’t call in regularly were usually not given work. Those who were diligent about calling in were sure to work every day. I kept a daily diary of each place I worked, noting anything interesting, unusual situations with customers, etc. and stamped the front of each page with the station’s dater-die, which was the identifying imprinter that a ticket clerk used to stamp on the back of each ticket sold, and on remittance sheets. Each dater die identified your station, your ticket clerk number at that station and the date. It was placed in the bottom of the dater-die machine, under the inked ribbon, so, when one slid the ticket, face-up, under the hammer portion, and smacked the top handle with their hand, the dater-die would come in contact with the inked ribbon and the back of the ticket being sold. Unlike a rubber stamp, these dies were made of brass. Beside my training at Farmingdale, I worked Merillon Avenue, East Rockaway (both mentioned in “Part 1”), Far Rockaway (Nameoke Avenue), Valley Stream, Syosset, Long Beach, Bay Shore, Penn Station, Flatbush Avenue and Jamaica (when the ticket windows were located along the north wall of the waiting room!). I also worked the Travel Information Center located on one of the upper floors of the general offices at Jamaica station and the Travel Information Center at Penn Station. The Travel Information Center at Penn Station was nicknamed “the Fishbowl,” as you sat in a small, glass-enclosed booth (very hot, no functioning air conditioning, just a small fan), located directly across from the LIRR ticket windows. People would line up and state their destination and you would provide them with the next train departing time and track number. You would also hand out timetables if requested. This was a very busy job! The regular clerk there was a many-year veteran named Tommy Johnston, who was also a railfan. The Travel Information Center at Jamaica answered train information requests via telephone. You sat with a bank of other clerks with headsets, facing front (west), with your supervisor sitting at an elevated desk behind you, keeping an eye on you to be sure you were answering calls and not spending too much time on each call. I worked the 2nd trick there several times, knocking off with just enough time to charge downstairs to the lobby, then back up the stairs to the under-track concourse and up the final set of stairs to track 8 where I would get the last train out to Patchogue with NO time to spare! Being cooped up in a room with no windows, in a cubicle facing front, a boss on your back all the time and having to ask permission to use the toilet provided me the incentive to become a Special Services Attendant and actually see train service the following summers!